Human beings must do more than mine and exploit the a'ina (Earth) for existence. We must change from a mining mentality to hearts of abundance. We must think in terms of providing food for ourselves and others, for communities and neighborhoods to secure themselves in a world ravaged by the unintended destructive consequences of modern living. Growing food--even a few edible plants on the porch or veranda--is the most primary step towards helping humanity develop a truly sustainable culture. Lanikai Farms offers a unique aquaculture educational system where children visit at no charge and learn the basic ecological principles of growing edible fish and plants, the importance of worms and microorganisms to healthy, truly sustainable agriculture, and methods to effectively manage insects without dangerous pesticides and herbicides. The aquaculture facility adjoins Fragrant Orchids of Maui, a commercial nursery that public visits to learn about orchids--wondrous flowering plants that evolved 150 million years ago. Living in tree canopies miles above earth's floor, orchids adapted to breathe air through their roots, while not requiring soil to provide water and nutrients. Lanikai Farms' aquaculture system and teaching program were designed by Lloyd Fischel, who the State of Hawaii honored as a Hero of Agriculture for Education (2010). Since the facility's opening in 2006, hundreds of youth from public and private schools and thousands of the general public have visited this beautiful classroom in nature. Lanikai Farms uses biological filtration and rainwater runoff channeled from adjoining nursery structures to create a healthy and financially efficient environment for raising fish. Designed by Lloyd Fischel, this commercial operation is the first of its kind on the island of Maui. 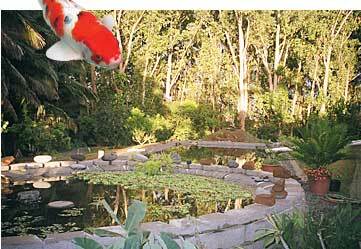 This photograph shows the 3,000 gallon biological filter with the 55,000 gallon breeding pond in the background. 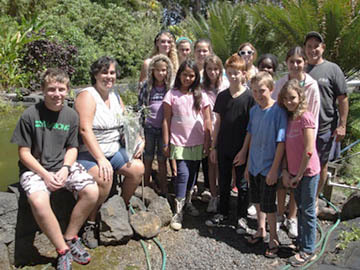 Lanikai Farms is a state-of-the-art facility open to schools for field trips (grades 5-12.) Students are taught the basics of fish farming for sustainable agriculture in a small or large space. The educational facility was funded in part by the U.S. Department of Commerce, NOAA Sea Grant's Pacific Tropical Ornamental Fish Program (PTOFP), and the Economic Development Alliance of Hawaii. Worms, Worms, Worms was founded with the hope of encouraging recycling of waste to grow vegetables and fruit in healthy soil. Traditional Hawaiian respect for a'ina, the earth, is a key value fundamental to the spirit of aloha, and fundamental to a healthy civilization. Through working with worms we have gained an understanding that these creatures are a fundamental constituent of healthy soil and sustainable commercial orchards and family gardens. The University of Hawaii's Agriculture Extension Service has tested Lanikai Farms worm castings (poop), and the ratings for several key minerals are off the charts! 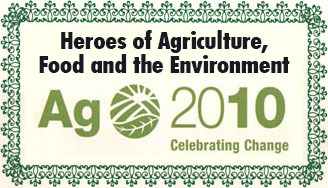 LLoyd Fischel and Lanikai Farms received the "Heroes of Agriculture 2010" award as recognition by the State of Hawaii for excellence in educating society about sustainable and biologic farming practices (versus mechanical or chemical practices) for growing fish and vegetables. 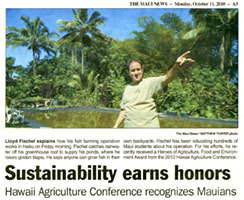 Lanikai Farms in The News: featured in The Maui News, October 11, 2010 - "Sustainability earns honors"
Aquaponics is a sybiotic, sustainable food production system that combines conventional aquaculture (raising fish in tanks) with hydroponics (growing plants in water). In such a system, the waste products of the fish are pumped into the plant area, where bacteria purify the wastewater and break it down into nutrients that the plants can use. The filtered, purified water is then recycled back to the tank where the fish live. 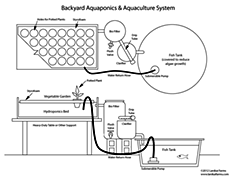 Lanikai farms provides infomation, classes and school field trip demonstrations about aquaculture and how to build and maintain such systems yourself. It's hard to believe, but over 90% of all food consumed on the Hawaiian Islands is imported. Most of the food is grown on the North American continent, and if petrol costs increase, or an environmental catastrophe should occur, the lack of preparedness and know-how to grow food will take a heavy toll on peoples' lives. Therefore, Lloyd co-founded the Farmers Union on Maui giving time and resources to help grow interest and knowledge about farming food. The ASA is a collaborative group of researchers, business owners, non-profit organizations and interested members of the public working to further Recirculating Aquaculture Systems (RAS) in the United States through research, education, legislative work and advocacy. We believe that RAS, closed-looped and biosecure aquaculture operations, are the best option to meet our country's need for a clean, green, sustainable, healthy seafood source to supplement our wild fisheries. 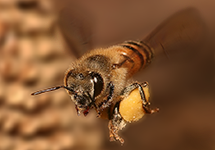 Honeybees are an integral part of the modern diet, worldwide. Without these amazing animals one-third of the food supply could not exist. Apples, cherries, citrus, squash, etc. etc. etc., are pollinated chiefly by honeybees. The worker bee is a social being that cannot exist without a queen bee, and the queen cannot exist without worker bees. In May 2013, Lanikai Farms was honored to co-sponsor a dialogue between top experts from the U.S. and Japan. Research in many countries has proven bee colony collapse disorder (CCD) began worldwide around 2005 coinciding when a class of chemical pesticides commonly referred to as neonicitenoids, were first marketed. Please see the film "Messages from Bees" by the Yamada Bee Company. We're figuring out how to improve bee strength as we learn and share healthy bee-keeping practices. At the turn of the 20th century Hawaii produced more honey than anywhere else, and today Hawaii is produces the most queen bees that are shipped worldwide. We are working to insure the vitally important work of growing healthy bees continues into the distant future. Library: The dangers of pesticides to pollinators. "Messages From Bees", a courageous film produced by Yamada Bee Company indicating the dangers of pesticides to the honeybee. Film length: 57:37. Experts joined to gather on Maui, Hawaii to discuss ways to further strengthen bee hives to overcome the many stresses of living in modern civilization. The one hour video above, "What You Don't Know About Bees, Honey!" gives insight into the complexities of bees and their home - the hive. This important international dialogue about bees was made possible by the capable and forward-thinking staff at Akaku Television, Maui. Ken Hashimoto, Yamada Bee Company, Japan. With a commitment to improving bee health and protecting the environment, Hashimoto heads the Institute for Bee Products and Human Health. He graduated from Kyushu University with a doctoral degree in bioenergetics-photosynthetic bacteria (1981), and did search on mitochondria in Department of Pathology, Hahnemann University, Philadelphia USA, as a research associate and later a seminar scientist from 1981 to 1984. Hashimoto did drug-discovery research in Japan from 1984 to 2004 before joining Yamada and heading its' research division. He has designed and sponsored and funded dozens of research projects on honey bees, perhaps the greatest amount of financing put towards bees by private entities in the world, and a myriad of other humanistic endeavors in many countries including in Yamada Bee Company's home country, Japan. Robert Danka, Louisiana State University, Professor - current research involves breeding honey bees to enhance desirable economic characteristics, especially genetic resistance to the parasitic mites varroa destructor (varroa mites) and acarapis woodi (tracheal mites). Tom Glenn, Glenn Apiaries is internationally recognized for expertise in rearing queen bees to select bees that are disease resistant as well as good honey producers. LLoyd Fischel co-produced the international dialogue on bees and poisons in May 2013. "A single bee can not exist without the others in a healthy environment. To me, honeybees and their amazing skills and communication means represent what human beings must achieve; otherwise our bee-hive society will not survive while we destroy everything else. As man-made toxins are abolished from the food chain, more and more people will take the responsibility and grow healthy food." Cedar trees live thousands of years, because insects and mold do not like cedar oil. Rodents don't like cedar oil and they quickly leave nests behind never to return. Cedar kills bed-bugs, lice, fleas and mosquitoes. Cedar is safe for people and pets, and today, our home and farm is free of chemical poisons - and you can be too! Safe and Natural pest control products using cedar oil are available for shipping nationwide from our new Cedar Pest Control site. Professional application is also available on Maui for residential, commercial and restaurant locations. 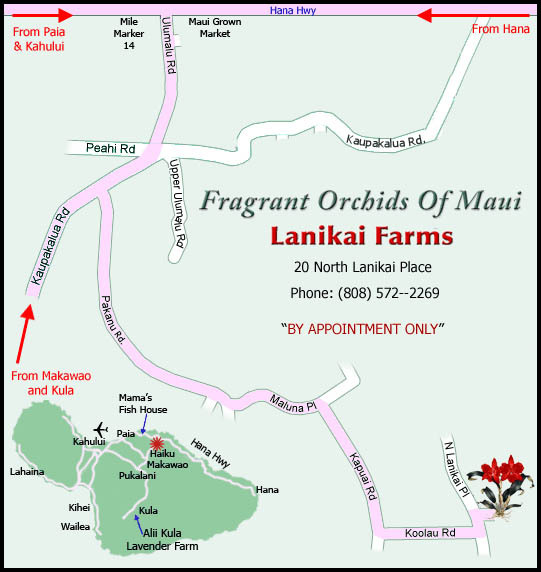 Lanikai Farms is located adjacent to Fragrant Orchids of Maui. Click to print Map and Directions. Take the Hana Highway 36 East. A few miles past Paia, after mile marker 14, turn right onto Ulumalu Road. At the first block turn left on Pakanu. Follow the fork left onto Maluna Place. First left onto Koolau Road. Turn left onto Lanikai Place. Head North on Kula Hwy. Follow Makawao Avenue through Makawao, it will turn into Kaupakalua Rd. At approx 3.6 Miles Turn right onto Pakanu Rd. The aquaculture teaching facility was developed under award NA06RG0436 from the National Oceanic and Atmospheric Administration, U.S. Department of Commerce. The statements, findings, conclusions, and recommendations are those of Lanikai Farms and do not necessarily reflect the views of the National Oceanic and Atmospheric Administration or the Department of Commerce. © 2015 Lanikai Farms LLC, All Rights Reserved.